The lead consortium partner on the £745million AWPR is to go into liquidation, threatening thousands of jobs. Carillion is working with Balfour Beatty and Morrison Construction under the Aberdeen Roads Limited banner on the major infrastructure project. The firm said it has “no choice but to take steps to enter into compulsory liquidation with immediate effect” after talks failed to find another way to deal with the company’s debts. But Scottish transport bosses have insisted that the Aberdeen bypass will still go ahead despite Carillion’s collapse. The stricken company, which employs 20,000 workers across Britain, said crunch talks over the weekend aimed at driving down debt and shoring up its balance sheet had failed to result in the “short-term financial support” it needed to continue trading while a deal was reached. The Government has urged staff to continue coming into work and said “those already receiving their pensions will continue to receive payment”. Britain’s second biggest construction firm is understood to have public sector or public/private partnership contracts worth £1.7 billion, including providing school dinners, cleaning and catering at NHS hospitals, construction work on rail projects such as HS2 and maintaining 50,000 Army base homes for the Ministry of Defence. Carillion had met lenders HSBC, Barclays, Santander and Royal Bank of Scotland on Wednesday to discuss options for reducing debts, recapitalise or restructure the group’s balance sheet. 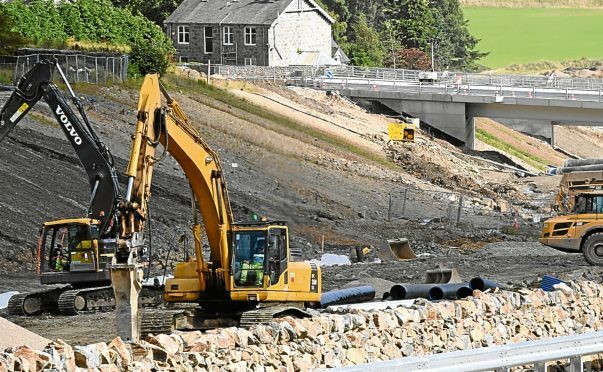 Last night, transport bosses insisted that even if the firm were to collapse, the delivery of the long-awaited Aberdeen bypass will not be affected as the other project partners have agreed to step in.